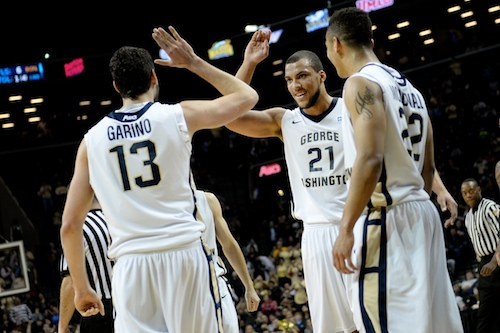 GW's Kevin Larson and Patricio Garino will look to lead the Colonials to a 2015 A-10 Championship. GW’s Kevin Larson and Patricio Garino will look to lead the Colonials to a 2015 A-10 Championship. Welcome to the Atlantic 10, Davidson. The Wildcats drew a brutal schedule for their inaugural A-10 season, getting home-and-homes with two teams that will be predicted to finish within the top three or four in the conference (VCU and GW). Richmond basically returns everyone after losing their two seniors halfway through last season, so will be a handful for the Wildcats as well both home and away. Hosting Dayton will be tough and add a tough road schedule and it will be a serious accomplishment if the Wildcats can finish within the top half of the conference. The good news for Dayton’s win/loss record is their home-and-home pairings are all winnable, both at UD Arena and on the road. That’s 10 games already that Dayton will likely be favorite to win. Their remaining home games are all against teams with some major question marks due to player graduation, a poor 13-14 performance, or in George Mason’s case, a combination of the two, and the Flyers are up to potentially 14 wins so far. Pull off at least one road win and the Flyers could be staring down a record somewhere in the neighborhood of 15-3. Dayton also has some nice RPI games as they play both GW and VCU on the road, however those games could have a negative A-10 tournament seeding effect on the Flyers if they aren’t able to steal a head-to-head tie-breaker from either team. The Dukes improved by four wins over the past two seasons in A-10 play but a quick look at next year’s slate suggests it could be tough keeping that pace even with an extra couple of opportunities next season. Four of Duquesne’s home-and-homes are against teams that won 20 games last season, the other, St. Bonaventure, won 18. That said, SLU is in a major rebuilding mode, SBU is a team the Dukes split the season series with last year, winning at home by two and losing on the road by four and Davidson is a SoCon team making a major step up in weight class. Add home games against Mason and Rhode Island, two teams the Dukes beat last season, as well as a road game against the always beatable Fordham and one against a La Salle squad that will lose three talented guards, and there’s certainly an opportunity for Jim Ferry and Co. to surprise. Fordham had two wins to 14 losses last season, so every game on this schedule is losable for the Rams. Getting a tough home slate won’t make things any easier for Tom Pecora’s club next season. Expect another rough year for the Rams. Mason is another team that has the misfortune of having to play in the “Atlantic 10 South”. Home-and-homes against VCU, GW and Richmond will be tough, then you throw a 20-win Davidson team in the mix and a rebuilding version of the reigning A-10 regular season champs and you’ve got a rough schedule already. I think the Patriots are going to have a tough time improving on last year’s four-win conference season. The Colonials will most likely be a top-three preseason pick and with this schedule I would expect them to finish within the top four of the conference. The home-and-home with VCU won’t be fun (they split this past season) but outside of that GW gets a pretty winnable road schedule, having their toughest games against rebuilding teams in Saint Joseph’s and La Salle as well as up-and-coming but still unproven Rhode Island and Richmond. Home games against Dayton and UMass without returns could be critical for their A-10 tournament seeding. It’s just so hard to have confidence in the Explorers after seeing the massive drop-off after the graduation of Ramone Galloway. The Explorers went from a Sweet 16 team to a completely mediocre squad with the loss of just one player, so one can only wonder what happens next season without the help of Tyreek Duran, Tyrone Garland and Sam Mills. Home-and-homes with Dayton, UMass, Rhode Island and a rebuilding Saint Joseph’s squad will be tough, then throw in tough home games against GW, Richmond and Davidson and a road schedule that sends them into the lions den of the Siegel Center and the always tricky Reilly Center and I just think their downward spiral could continue. For starters, UMass’ home-and-homes are very winnable with the talent the Minutemen have returning to Amherst (as well as the addition of WVU transfer, Jabari Hinds). The one proven team on that list, Saint Joseph’s, loses the heart and soul of last year’s A-10 tournament championship team. Roadies at VCU and GW will with no returns will probably hurt the Minutemen’s A-10 tournament seeding, but overall Derrek Kellog has a great shot at another 20-win season, which would be his fourth in as many seasons. Ah, Rhode Island. Who are you Rhode Island? Who will you become? The Rams were expected to make a jump last season that never happened, yet still managed to pull off wins against LSU, Dayton and Richmond, not to mention a 1-point loss to a very good SLU team, but also dropped games to the likes of Fordham, George Mason and Duquesne. That’s what makes it so hard to analyze this schedule. I have no clue of just how capable next season’s team is. There are talented pieces, sure, but there were talented pieces last year, and one of those talented pieces just graduated. This past preseason this would have looked like a nightmare schedule, but La Salle, Saint Joseph’s and Saint Louis are all in a rebuild. The Rams also host both GW and VCU, so IF Dan Hurley’s squad really is ready to make the jump (if if if), they’ve got the favorable schedule to really make a rise. The Spiders started last season 8-4 in conference play and looked like a real threat to challenge for a first-round tournament bye in Brooklyn. Then came the four game losing streak and a 1-5 record to finish the season at 8-8. They return all of the pieces from the group that went 5-6 after the losing Cedrick Lindsay, and add a talented transfer in 6’8 deep threat, TJ Cline from Niagara, but those are the pieces that finished under .500 to end the season. Home-and-homes against VCU and GW don’t do their schedule any favors and the Spiders must also travel to Dayton and UMass, as well as Philly twice for what could be tough road games at La Salle and Saint Joseph’s. I think the Spiders are looking at another season right around .500. The Bonnies finished 6-10 last season and as I look at this, I have a hard time finding many more than six wins this year as well. St. Bonaventure loses their top two guards and got one of the tougher schedules released by the Atlantic 10. Seriously, give me seven games on that schedule you think they definitely win. The Hawks finished 10th in 2013, then won the A-10 tournament in 2014. Who shows up next year? Well, we know Langston Galloway, Ronald Roberts Jr. and Halil Kanacevic don’t, and that hurts, but I think Phil Martelli and Co. got a relatively favorable schedule for their rebuild. When you lose all five of your starters and over 70% of your scoring, any schedule is a challenge. The Bills just so happened to get home-and-homes with Dayton and VCU on top of that, two potential top-three squads next season. Add road games at GW, Richmond and Davidson and a handful of tough home games and Jim Crews’ team will most certainly find themselves in unfamiliar territory. The Rams will most likely be your preseason No.1 and have a schedule that could help them finish the regular season there as well. Outside of their home-and-homes, the bulk of VCU’s challenging games will be held at the Siegel Center where the Rams went undefeated last season. The only major downside to this schedule for Shaka Smart’s team is it doesn’t present a ton of top-50 road win opportunities come NCAA tournament selection time. “@A10Talk: Instant Reaction: Thoughts on A10 sched pairings: http://t.co/jwx1WhBNgg” Kudos2 #VCU’s @MatShelton 4cranking outha #A10 content!